Customised Mouse Pads to provide comfort to the user while browsing. These rubber mouse pads offer a better grip and friction which enables the user to move the mouse freely without much difficulty. Our mouse pads can be customised according to your requirements. You can get your brand name and logo imprinted on the pads to promote your brand and ensure smooth functioning of the mouse. Plus, they are available in as many as 4 shapes - rectangular, square, round and oval. A custom computer mouse has been paired with mouse pads in one form or another for about 50 long years. Mouse pads serve several important functions. They keep your desk looking like a piece of new wood. The repeated motions of the rubber or plastic feet of your computer mouse against the surface of your desk will wear away the finish of the wood if it’s not maintained properly. It’s much cheaper to replace a mouse pad than replace your desktop surface, isn’t it? Customized Mouse Pads provide comfort to the user while browsing. They offer a better grip and friction which enables to move the mouse freely without any difficulty. Printstop’s mouse pads can be customized according to your promotional requirements. You can get your brand name and logo imprinted on the pads to promote your brand and ensure smooth functioning of the mouse. Plus, they are available in 4 different shapes - rectangular, square, round and oval. Personalised mouse pads are a new generation product, sold and supplied by a network of online stores throughout the country. When it comes to choosing the best custom mouse pads, Printstop is the best place. It is important to choose the best supplier in order to purchase high-quality products. PrintStop is a one-stop online store and is one of the fastest growing suppliers of customised mouse pads. We provide our customers with much useful information on product features and specifications, allowing them to choose the right product in no time. At PrintStop, we have highly skilled professionals who love giving attention to details and print the custom mouse pads attractive and extra special. The mouse pads are customized with your favorite designs and specifications. Also, the custom mouse pads have an eye-catching design to connect with our customers and stand out from the competition. We help to build up your brand name by adding your company logo on custom mouse pads. Custom made mouse pads are available online like most other products and accessories. It is highly important to make the right choice and the right provider. Majority of the people look for designs, shapes and quality of the rubber being. 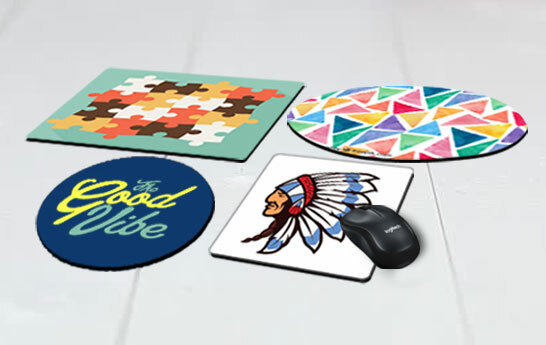 Mouse pads with impressive designs attract customers in the market and it is considered to be a niche in the trending custom mouse pads designing business as well. These custom mouse pads are designed to keep your work plan organized in style at all times. Order now and receive a custom mouse pads within 8 business days. Find joy in your shopping with custom mouse pads of your choice only from PrintStop. We also have products similar to mouse pads such as tea coasters, which can be customized with the same designs. For more details on our marketing products, please contact us.